What is the worst part about cooking all day in the kitchen? Your feet get tired! I don’t even have to be in the kitchen all day for my feet start to ache on our ceramic floor. Fabio Viviani, professional chef, knows how it feels when his feet, legs, and back started taking a serious toll when when he cooked for long periods of time, which for him is daily. He designed Comfort Mats to help with health and comfort! Each mat is designed to help with muscle fatigue and improve circulation. Beveled edges make them both trip-proof and wheelchair-friendly. The SmartTech Polyurethane material is heat, tear, puncture, and spill resistant making for easy clean up. Just wipe right up! Comfort Mats will never curl or wear and will return back to their original shape after every use and they have a 7-year guarantee to back that up. Non-toxic which I know is important to many of us. They are engineered with a unique one-piece construction which has eliminated the need for any glues or harmful bonding agents that break down and off-gas noxious chemicals and smells over time. I love love love these mats and would feel naked if I wasn’t standing on one in my kitchen. I will admit to you that I am not a huge cook. I’m pretty basic and spend the least amount of time in this room as I have to. I still need these mats! They would be great for MANY jobs too. Anyone who stands in basically the same place could benefit from one. I received a mat for my review free of charge and all opinions are my own. This giveaway will end on August 21, 2013 at midnight EST. Winners will be drawn via rafflecopter. Once a winner is drawn I will contact them and they will have 48 hours to reply before I draw a new winner. Giveaway is open to anyone in US and you must be 18 years of age or older. Giveaway not affiliated with Facebook & I release them of liability. Winner will be posted in the rafflecopter widget. I feel like my feet are always killing me. I'd love one of these mats in my kitchen! I am a HUGE FABIO fan! I loved watching him on Top Chef. Didn't know he had a line of mats like this. I think this would be super beneficial! Thanks for the opportunity! We like this type of mat in our kitchen and in my husband's work shop. It would be comfy under the feet in a bathroom too but I don't spend too much time standing in there. I'd use it in the kitchen. My back always starts hurting when I stand at the kitchen sink. I'd love to use this in front of my kitchen sink. I spend way too much time there and my feet/legs are always hurting. I'd love one in my kitchen. I make dinner every night and now that we're starting to can all the goodness from the garden, I'm on my feet for hours! I think I would benefit from a comfort mat, my mother-in-law has one and loves it....I would definitely use it in the kitchen. :-) Thank you. I could really use this in my kitchen! i would love it next to my sink when I wash dishes! i could definitely use this! i am in the kitchen a lot,whether it's cooking or doing endless dishes.this would be great for my feet and back. I would love this for my kitchen! This would ease my tootsies in the kitchen, for sure! I had surgery on my foot and the heel has been so sensitive since. I could definately use the mat. I love my granite floor - so beautiful. BUT, very hard on my feet. I would love to have one of these mats for my long recipe testing sessions! As much time as I spend in the kitchen, I could use the relief. I have severe arthritis, degenerative disk disease, fibromyalgia, chronic pain, and other health issues that make it hurt for me to stand. This would help so much! I would use it in the kitchen and in the bathroom. I could kneel on it when my fiance' washes my hair instead of folding up three towels to put under my knees, which still hurts my knees and back. Thank you for this wonderful giveaway! I would love one in the kitchen. I love the Toscana Mocha design. I have very bad feet/knees so I could really use this wonderful mat! Yup, I would love to use this in the kitchen! I;d use this in the kitchen where I stand for hours... washing dishes or chopping veggies. I think I would definitely benefit from this comfort mat. I would use it in the kitchen, at the sink, because I am always in there cleaning dishes! I would definitely use this in the kitchen because that's where I'm on my feet a lot! This would be great. I have a bad back and it hurts when I do dishes. I would love to win this, my back aches every time I do the dishes. I would use it in my kitchen. We all stand when cooking, canning and doing dishes, so why not be a little bit more comfortable too. This would be perfect in front of the stove! Much easier on my feet and legs after a long day on them while cooking dinner! I would benefit from keeping this in my kitchen for when I am on my feet for a long time preparing food. This mat would help my back and feet feel better. Yes, great benefits!!! I'd use in the kitchen, and my daughter that bakes a lot for Farmers' Market would really use it. oh my - would totally benefit. My neck and back not the same since my cancer surgery. Yes, in the kitchen!! I'm in the process of renovating my kitchen! This would be perfect timing! Yes, I would use it in my kitchen and love it especially when doing the dishes! I would replace a junky old mat in the Kitchen! In the kitchen... I babywear while cooking and cleaning. We could use it in the kitchen! I love to cook, but my legs and back hurt if I stand in the kitchen too long! I would love one! I'd use it in my bathroom. Although I also love their 6' option and would use that in our laundry room! I have a very annoying bad knee and this would help a lot. I would use it in my kitchen where I am on my feet the most. I would use it in the kitchen, I do way too many dishes by hand! This looks great! I'd love to have it in my kitchen! I would love to have one of these mats. I have back problems and this would help me a lot. I think this would be great in my kitchen in front of the sink! My Mom would like something like this. I’d love to have this at the sink where I wash dishes. I would use it in the kitchen and/or at my crafting table. I have pain issues and this would help a lot! Thank you-great chance! My back always ends up hurting while I was dishes. I wonder if this would help? It looks like it could. Thanks for the giveaway! My mom got one of these comfort mats for her birthday. She loves it--and so do I! Thanks so much for the chance. Yes I've wanted one of these for years! I've had reconstruction done post-mastectomy and my back muscles hurt so much. I'd really benefit from a comfort mat, especially in the summer when I spend hours on my feet on the hard kitchen floor putting up all the garden goodies for the winter! 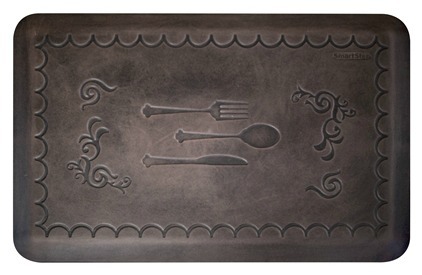 Since retiring, I've become quite a chef and I sure could use a comfort mat like this one! I wish I had one of these before me knee replacement. I would use it in the kitchen because my feet and knees really could use the cushioning. Yes, I could definitely benefit. I would use in the kitchen; I am always cooking, so I would this would really come in handy. I have a knock-off mat from a closeout store and it helps but we're always tripping over the curled up edge. i would for sure, spend a lot of time in kitchen cooking cleaning, they look nice too. Would love to have this for my kitchen. I would love this! I think it would help me be more comfortable when I am cooking/baking and be able to do more! My mother in law would love this in her kitchen. This would be great for when I'm cooking especially around the holidays. I love that it lays flat and won't curl around the edges. I could definitely benefit from a Comfort Mat and would use it in my kitchen. I think this would be great to have in my kitchen. I would certainly benefit from this. I have to stand at my sink to wash dishes by hand and sometimes it can take forever. I would use this right in that spot. So I am all kinds of jealous knowing that you got one of these to review! I have wanted one for my kitchen FOREVER!!! Right now it would be a godsend since for the first time in my life I've pulled a lower back muscle and well lets just say, finding a comfortable position to do many things will no longer be something I take for granted. This would be great for cooking and washing dishes in the kitchen right now and these are sooooo beautiful! I think this would be great - we could definitely use and benefit from this win. I would love to have one of these mats for my kitchen! With a family of 5 I have a lot of dishes to wash and I have problems with my legs if I stand for long periods. I def could benefit as I have arthritis in by spine and fibro, what a relief this would be. I would use it in the kitchen . I am hoping to win this maybe it will help with my back. I would use it in the kitchen in front of the sink. I have heel pain so I would use this in the kitchen. Would use this in my kitchen, in front of my stove. I have arthritis in my knees. I really think this would be great in front of my sink area in my kitchen. I spend a lot of time there while fixing dinner, washing dishes, and washing the eggs our chickens lay! I definitely would benefit from a comfort mat, we don't have a dishwasher and sometimes there are piles of dishes and either my husband or I are standing there for awhile. Obviously, we'd use it in the kitchen. My feet hurt after standing in the kitchen for hours, so I know this mat would be great for me! Absolutely! I would use it in the kitchen, that's where I stand in one spot longest. Thanks! Yes, I could definitely benefit from this in front of my kitchen sink. My mum lives with me now. She loves mats. I hate them. I tend to be clutzy and forever getting tripped by the edges of the mats she puts around the house. This looks like one I can work with since the edges don't curl up. A very big plus for someone like me! Thanks for the giveaway, and much more importantly in this case, the review!. We just bought a new home and would love to win this for our kitchen. I have a similar mat in front of the stove but need another in front of the sink. I love these! Boy that would be great; I spend so much time standing at the sink! I would love to use it in the kitchen. I feel like I spend so much time by the kitchen sink. Thanks! I have a soft mat in my kitchen already but I could really use one in my laundry room! I could really use it with all the dishes I do. I am always in the kitchen cooking something and with back problems this would be a great help to me. I'd give it to my mom to ease her arthritis pain while she cooks. I would love a mat like this. I would use it in front of the sink for when I do dishes. I would love it in the kitchen. I cook and bake all the time. I do think I would benefit from having it and I would use it in the Kitchen! We have a bath mat in our kitchen currently. My husband and I cook a lot so this would be awesome for our kitchen! Oh I think this would be wonderful and take some pressure off my back went doing dishes at the sink! I would use it in my kitchen! I think I would benefit and I would use it in my kitchen. I would use it in the kitchen and would benefit from it when standing to do my dishes. Yes, I think I would benefit from this mat. I would use it in the kitchen to stand on while doing dishes and/or cutting up/chopping food, etc. It would help my tired, aching feet! the comfort mat would help ease the pain in my hips from bursitis. The kitchen sink area placement is perfect for me! I would love this mat in my kitchen. I would use it in the kitchen. 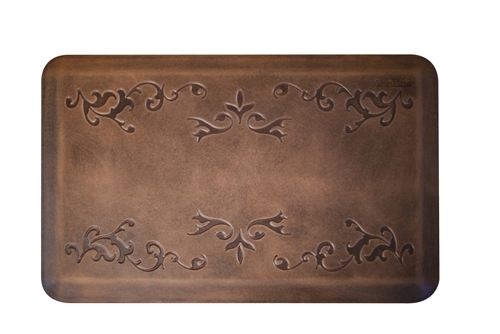 I think I would benefit greatly from a Fabio Viviani Comfort Mat in front of my kitchen island. This would be great for marathon baking sessions in the kitchen! I would love this in my kitchen! My husband had knee surgery when he was in high school, and he is usually the dish-doer so this would be great! I would also love it for myself while doing kitchen prep stuff. Thanks for the chance to win! Both me and my Honey/Hubby would very much benefit from the Comfort Mat - especially in the kitchen (and also in my Honey's basement workshop!) My feet have always been tempermental and my hack and neck bother me a lot. My Hubby had total hip replacement surgery last year on one hip and is scheduled to have the other hip replaced later this Fall. We need all the help we can get! I think this would be great for sore feet! I could definitely benefit from this great mat. I have severe back and leg pain and if I stand for too long, I really suffer. Thanks for the giveaway! I'm on my feet a lot in the kitchen, so this mat would be nice for my back! I definitely need this. I would use it in the kitchen. I would use this in the kitchen to make it much easier on my back. I would use it in the kitchen, to help my back and feet while I wash the dishes! As much I cook,I would definitely use this in the kitchen! I would definitely use this in front of the kitchen sink. I would use this in front on my kitchen sink! Maybe that would make doing dishes more enjoyable! This mat would definitely benefit my feet and legs! I would put one in front of my sink in the kitchen! Thank You! I would use the Comfort Mat in my kitchen. I think it would help me immensely. It seems I'm always standing by the sink peeling and/or cutting - when I'm not doing the dishes or whatever else needs to be done. I think it would help me legs a lot. Thanks. I would definitely use it in the kitchen. I have diabetic neuropathy and I'm sure it would help my feet since I'm in the kitchen a lot. I would love one where I spend a lot of time, in front of my sink washing dishes. Thanks!